Thanks to Universal Pictures Home Entertainment we have A DOG'S PURPOSE on (Blu-ray + DVD + Digital HD) to giveaway to some lucky fans. 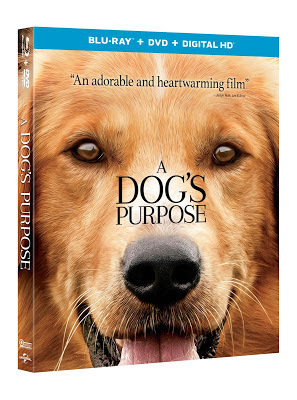 An uplifting and inspirational look at life through the eyes of man’s best friend warms hearts this spring when A Dog’s Purpose is on Digital HD and on Blu-ray™ Combo Pack, DVD and On Demand on May 2, 2017, from Amblin Entertainment and Universal Pictures Home Entertainment. An empathetic and relatable drama, this sentimental film takes viewers on a powerful journey to experience the relationship between dogs and their owner – to love, protect, comfort and always find a way back home. Based on the beloved bestselling novel by W. Bruce Cameron, A Dog’s Purpose, from director Lasse Hallström (The Cider House Rules, Dear John, The 100-Foot Journey), shares the soulful and surprising story of one devoted dog (voiced by Josh Gad – Frozen, Angry Birds) who finds the meaning of his own existence through the lives of the humans he teaches to laugh and love. A narrative with “genuine heart, humor and a real message of love” (Michael Heaton, The Plain Dealer), the family film told from the dog’s perspective also stars Britt Robertson (Tomorrowland, The Longest Ride), KJ Apa (“Riverdale”), John Ortiz (Silver Linings Playbook, American Gangster), Juliet Rylance (Sinister, “The Knick”), Luke Kirby (“The Astronaut Wives Club”), Peggy Lipton (When in Rome, Twin Peaks), Pooch Hall (“The Game,” “Ray Donovan”) and Dennis Quaid (Far From Heaven, The Rookie). • Lights, Camera, Woof! - A behind-the-scenes look at the making of the film. • A Writer’s Purpose - Learn the story behind W. Bruce Cameron’s beloved best-selling novel. • Digital HD with UltraViolet™ lets you watch movies anywhere, on any device. Users can instantly stream or download movies to watch on iPad®, iPhone®, Android™, smart TVs, connected Blu-ray™ players, game consoles and more. Copyright: 2016 Universal Studios and Storyteller Distribution Co., LLC. Amblin Entertainment is a production label of Amblin Partners, a content creation company formed by Steven Spielberg, the former DreamWorks Studios, Participant Media, Reliance Entertainment and Entertainment One (eOne). The company develops and produces films using the Amblin Entertainment, DreamWorks Pictures and Participant banners and includes Amblin Television, a longtime leader in quality programming. The company’s first film, “Bridge of Spies,” was released to critical acclaim in October 2015. Other projects in various stages of production include: “Ghost in the Shell,” scheduled for release on March 31, 2017; “Thank You For Your Service,” scheduled for release in 2017; and “Ready Player One,” scheduled for release in March, 2018. Upcoming shows from Amblin TV include the 5th season of the Emmy nominated series, “The Americans” on FX and “Five Came Back” which will premiere on Netflix on March 31, 2017. Current shows include the top-rated new drama of the season, “Bull,” airing on CBS.